As expected, MACNA 2016 in San Diego, delivered another crop of new and innovative products into the aquarium market. There were so many exciting products on display and we look forward to reviewing many of them for you in coming days and weeks. We wanted to start with one of our favorites, the Seneye Reef Monitoring System and PAR Meter. Seneye’s owner and founder, Matt Stevenson, is an avid supporter of MACNA, the aquarium industry and hobbyists. As one of the supporters of AquaNerd, Matt was kind enough to give us a personal demonstration of the functions and features of Seneye’s exciting new product. 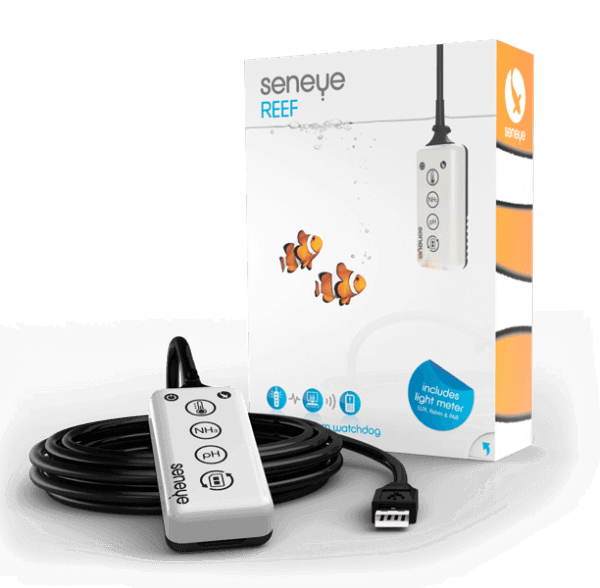 We have watched with keen interest as Seneye has become recognized and popular among aquarists around the world. So what’s so unique about Seneye and why should you consider using one in your aquarium? For many Hobbyists, one of the biggest draws is the built-in underwater light meter, a standard feature on the Seneye Reef model. The light meter has proven to be as accurate as many hand held units, which can cost as much as 5 times the price. Also, unique to Seneye, the monitor includes 24/7 monitoring of ammonia. A popular belief among seasoned hobbyists is that ammonia is not an issue after a tank has initially cycled. But wait, isn’t ammonia the first chain in the nitrogen cycle? The answer is yes, and it’s constantly being produced as fish and other animals produce waste in the aquarium and this brings Seneye’s relevance to monitoring ammonia levels in the aquarium. Let’s look at a scenario, where you have been slightly over feeding your fish over a period of time or a fish has died without being quickly removed from the aquarium. In this scenario, ammonia can spike, causing irritation to fish gills. Additionally, it can also cause stress to aquarium fish before the ammonia is converted to nitrite (NO2) and then to nitrate (NO3). Because of this cycle, you can be sure that if you have a nitrate spike, at some point in the week prior you have also had an ammonia spike. So why do aquarists often monitor nitrate but not ammonia? This is likely because many aquarists only concerning themselves with the final step in nitrogen cycle. Wouldn’t it make more sense to also monitor ammonia and try and get ahead of the nitrate issue? Seneye thinks so. As ammonia is produced from decaying organic matter, spikes can and will occur even in an established aquarium. If monitored these spikes can be addressed before a spike in NO3 occurs. Think of ammonia monitoring as an early warning system for an impending spike in nitrates. Ammonia exists in two forms in the aquarium and the first step in avoiding, or at least mitigating a nitrate spike, is to understand the difference between ammonium NH4 and free ammonia NH3. NH3 (ammonia) is a gas and is sometimes referred to as toxic or free ammonia. NH3 is the unionized form of NH4 (ammonium) which is a nontoxic salt and ionized of ammonia. Together, NH3 and NH4 are often referred to as total ammonia nitrogen (TAN). The Seneye monitor only measures toxic free ammonia NH3. The monitor stores the data on seneye.me allowing the aquarist to see how much free ammonia (between 0.000ppm and 0.500ppm) is present in the aquarium. Most ammonia test kits measuring TAN are labeled as an NH3/NH4, however, there are some kits that are simply labeled ammonia test kits that will also measure TAN. The TAN measurement is done by changing the pH of the water sample. (If your kit contains a small bottle marked harmful corrosive, you are likely using a kit that will measure TAN.) Using NH4 temperature and pH to accurately work out how much NH3 is present is very difficult. PH and temperature have a great effect on the ratio (equilibrium) of NH3 to NH4. As pH changes upward more NH4 will turn into NH3 and vice versa. This is often a surprise to people but a change as small as 1 point in PH gives a 10x change in NH3 levels. As the PH drops lower, the amount of NH3 gets lower and lower. if you look at the screen shot photo below you will see a spike in a maturing system where Seneye purposefully lowered the pH, you will see at the exact same time there was a dip in ammonia, before both going back up. This exercise alone shows how accurate and how important the Seneye System is for monitoring and reporting back the real time health of your biological system in your aquarium. Why leave it to chance, or wait for a Nitrate spike to occur, when the Seneye Monitor can warn you far in advance of in issue so you can take appropriate action. NOTHING ELSE on the market can offer this, not to mention the built in PAR meter, temperature monitor, pH monitor, O2 display and level warning. So we have addressed the importance of measuring toxic free ammonia NH3 but the question remains, why also monitor NH4 if it is considered harmless? Let us start by explainging NH4. NH4 (ammonium) is a nontoxic salt that is the ionized form of toxic ammonia NH3. It is useful to understand that in the aquatic environment NH4 is not toxic, however it does have the ability to instantly change to NH3 with a change in pH and or temperature. This is why people often worry about high levels of NH4 when they do water tests. As NH4 accumulating is not harmful in itself, it does have the ability to convert to NH3. Using traditional methods, free ammonia (NH3) is very hard to measure so normally people measure non-toxic ammonium (NH4) in the aquarium and pond and use that measurement as a guide to safe levels of NH3. In true terms NH4 is a nontoxic substance in the aquarium, however due to the equilibrium which occurs between NH3 / NH4 at a given pH and temperature it is better to measure NH4 as an indicator of NH3 than nothing at all. Interpretation of NH4 to estimate NH3 is most often done by a chart supplied with the test kit or by a calculation online. If you are using these methods as a guide to NH3 in the aquarium, do not expect it to exactly match the Seneye monitor. All measurement devices and test kits will have some margin of error and when using 3 different measurements in a calculation and a small inaccuracy on each can heavily skew the result. Calculations and look up tables do not take into account ionic strength or air pressure which can both influence the NH3 / NH4 balance. Seneye measures deadly NH3 directly and it can also calculate NH4 through a widget on the seneye.me dashboard and a calculation is derived from the known pH, temp and NH3 reported by your seneye device. For the same reasons stated above it should only be used as a rough guide. Please note: Ammonia and ammonium (NH3+NH4) together are usually described as TAN or total ammonia nitrogen. Often test kits measure TAN not NH4 or NH3, this can make accurate NH3 calculations even harder. Looking at the screen shots below you will see the direct relationship of the NH4 level and pH level, as pH rises the NH4 level drops. The Seneye typically sells for $199.00 online and at your local retailer. To visit Seneye click here.